… track your location, and use that to discover private things about you, like if you’re sick (because you’re at the doctor or a specialist), who you sleep with (who’s beside you at night), where you work, if you’re job-searching (1-hour meetings at competitors offices), etc. This is before we consider the fact that messenger and what’s app both know who you talk to, and in the case of messenger can read your texts for content and meta data. They also upload your address books to try and sell Facebook to the unconnected. They sell the data to corporate and political entities. He also talks about the filtering of messages, such that you don’t always get posts from friends; it’s not even reliable. They block people at very low volumes of complaint which opens the process up to abuse by colluding with denial of service attacks designed to censor opposite opinions. This all leads to you act as observation points for those that don’t want to be on Facebook. We are the agents in the corporate surveillance society. Why can’t the Labour Party recognise that fair votes heal? If you’ve done your best and lost, then it’s easier to accept the will of the majority. While it’s always been a ploy to manipulate the short lists for selections, there’s an ugly rumour going round that Lewisham’s Mayoral Selection committee plan to propose a short list of two, one woman and one man to put to the members. The big picture is that the candidate will be chosen by a one member, one vote; members should be given a diverse choice of competent candidates. Proposing a candidate that doesn’t come from such a competition, is contemptuous of the electorate, and dangerous for the Party as the experience of Gordon Brown and Theresa May, who both avoided their membership confirmation have shown. Labour’s rules emphasise fairness to candidates and members in several places. Chapter 1.VIII.N NEC & Equalities Policy, sets out our equality goals, supporting the representation of working class, women, ethnic minority, LGBT and disability candidates and the NEC’s duty to pursue it. In Chapter 4.I.1 they declare the that fair elections will be held, obvious it would seem but the Judges quoted this in the 2016 cases. The rule applies to internal officer elections, but if they can import freeze dates into internal elections from Chapter 5, then the overall duty of fairness from Chapter 4 can be applied to Chapter 5 (Candidates for Office) selections. i. The Party will take action in all selections to encourage a greater level of representation and participation of groups of people in our society who are currently under-represented in our democratic institutions. In particular, the Party will seek to select more candidates who reflect the full diversity of our society in terms of gender, race, sexual orientation and disability, and to increase working class representation. i. Procedural rules and guidelines for these selections shall endeavour to be clear, simple and easy to administer by Party units. Support shall be provided to those administering the selections process. Transparency, and that word is why I publish the rule title would suggest the rules are published in advance and available to all. It would seem that this rule has not been so well read. I was of the view that a rule exists that states there must be at least three candidates for a single post selection, but I can’t find it today; I must have seen it somewhere, perhaps its in some of the procedural guidelines for parliamentary selections, which not all members get to see. The ballot for Labour’s Conference arrangements committee have opened, emails with unique passwords are being sent this week. There are two slates, one supporting the current Leadership, and one representing New Labour continuity. 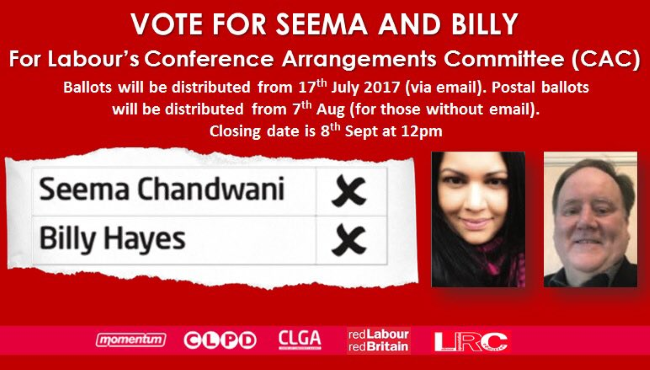 I have voted for Seema Chandwani & Billy Hayes. I suggest you do too. And’ here’s Party Time 2, why Branch AGMs are important! Jonah Burch looks at Europe’s Social Democratic parties, their successes and collapse and calls for a reinvestment in class struggle tactics. Things, I think he missed. In the UK, the ’83 manifesto, allegedly the longest suicide note in history’ the election was lost for two main reasons, the Right walked out and founded a new centre left party (without the Unions). The UK’s first past the post electoral system punished Labour for this and it took many years to recover those votes. The second factor was Thatcher’s post Falkland’s war popularity, a feature of which was WW2 veterans refusing to back Lbaour’s perceived pacifism in the face of an assault by a military dictatorship. The Miner’s strike, together with weaker public sector strikes gutted the confidence of the Unions. It was a strike that Government (and Capitalism) had to win as they transitioned to the Oil economy. Coal was no longer need in the UK (or anywhere in Europe). We are only just discovering how far they went. See Justice for Orgreave. Today, it’s the Oil Tanker drivers wo are the only Union that cannot be defeated and the state has colonised them in the same way they colonised the Electricians in the 70s & 80s. Today though we see new hope as the old Unions organise in the 21st century factories, and new Unionism takes on the gig economy. The Thatcher era home owner revolution and the pension industry (social security?) reforms are also major inhibitors of the sort of action that the organised working class had been capable of. The former creates debt and a need for cash flow, the latter makes confiscatory or damaging anti-capitalist reforms even those based on direct action less popular. I wish he’d mentioned the direct action, particularly around housing repossession that are or have taken place in Spain. I also think he should have spent a bit more time on Germany. It’s role as the front line in the Cold War, the historic 20th century weakness of its centre-left, and the current post-wende bifurcation of the Left within the united German state are all worthy of study, as is the destruction of the post-soviet economies, critically in East Germany but also in the rest of Eastern Europe. Don’t you just want to live in Denmark or Sweden? The Canary catalogues the internal furore in the Conservative Party in Parliament. It seems they are referring to each other as fuckers (Brexiters) and wankers (Remoaners). Lovely. There’s one line where the Canary suggests that the Brexiteers might actually ally with Labour to stop a Tory U-turn. It would be astonishing if they did, but Enoch Powell, at that time still a Tory recommended Labour vote over Europe in 1974.